Concept cars are not just buzz-generating showpieces. They hint at the design direction of a brand, with styling cues and technology filtering down to production models. 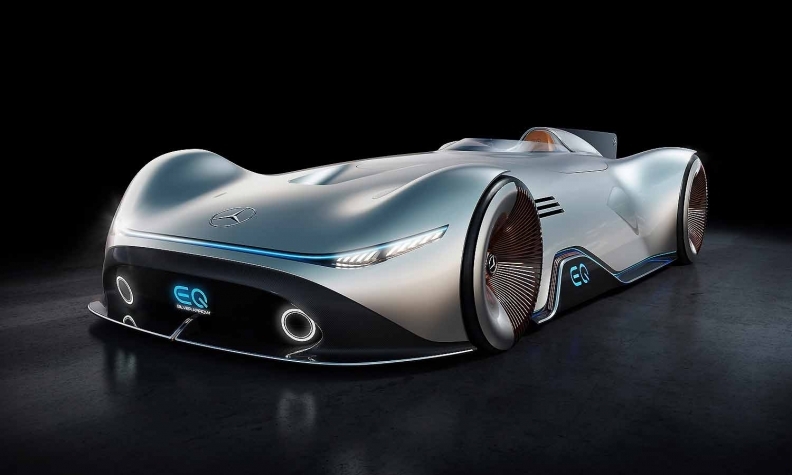 With its sweeping lines, Mercedes-Benz's EQ Silver Arrow all-electric concept offers an early, if idealistic, look at some design elements and technologies that might end up in the automaker's wave of planned electric vehicles. The one-seater EQ Silver Arrow, unveiled at the Pebble Beach Concours d'Elegance on Friday, pays homage to the W 125 Grand Prix racer, considered the most powerful race car ever for three decades. The Mercedes-built W 125, designed by Rudolf Uhlenhaut, was used by Rudolf Caracciola to win the 1937 European Championship. The twelve-cylinder W 125 held the speed record on public roads (432.7 kph, 268.9 mph) until November 2017. The 738 hp EQ Silver Arrow has a driving range of more than 400 km (250 miles). Side air vents help cool the 80 kWh battery. While the EQ Silver Arrow isn't expected to make it to production, it will likely influence the 10 EQ-branded electric vehicles Mercedes plans to rollout by 2022. The EQ vehicles, which include a subcompact sedan, compact crossover and a luxury sedan, are part of 50 electrified vehicles Mercedes has on the drawing board. 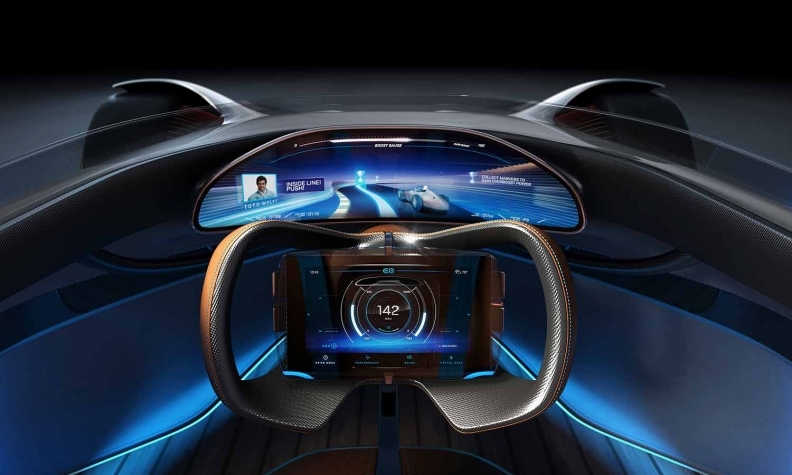 "Intended for acceleration and driving pleasure, it embodies progressive luxury and provides an insight into the future of our design," Gorden Wagener, Daimler's chief design officer said of the EQ Silver Arrow in a statement. "The show car drives the design idiom of our new EQ product and technology brand to the top." All-electric speedster concepts are popular at this year's Pebble Beach showcase. On Thursday, Infiniti unveiled its Prototype 10 single-seater concept. The EQ Silver Arrow, made of carbon fiber, wears the design cues of a vintage racer, beginning with a mile-long hood and ending with an aerodynamic fin behind the cockpit. The rear diffuser is reminiscent of motorsports with two extendible rear spoilers that act as an air brake by increasing wind resistance. Multiple layers of paintwork in Alubeam Silver harken to the historic Silver Arrows which, for weight reasons, did not have a white paint layer. But, that's about where the "vintage" ends in the futuristic Silver Arrow. The front bumper is a display; the sleek headlights are connected with a lighting strip. The side skirts also feature a lighting strip and the large, recessed EQ lettering in front of the rear wheels is illuminated in blue, as is characteristic of the Mercedes electric vehicle subbrand. The EQ Silver Arrow wears bespoke shoes. The 168 spokes per wheel are made of lightweight aluminum and painted a rose gold color, a signature of the EQ brand. Technology in the EQ Silver Arrow extends into the interior. The driver is enveloped by a panoramic screen on which a 3D image of the surroundings is projected from behind. Driving modes are selected via a steering wheel-mounted touchscreen. Driving a battery electric vehicle does not mean sacrificing that visceral element of the race car experience. The EQ Silver Arrow can pipe in "engine sound," including that of a current Formula 1 Silver Arrow, or a Mercedes-AMG V-8 engine. The car incorporates gamification technology, too. The driver can compete against historic or present Silver Arrow racing cars on a virtual racetrack superimposed onto the actual roadway. The driver sees their opponent either ahead of them or behind them as a "ghost." An artificial intelligence-based voice assistant helpfully offers driving instructions during the race. The EQ Silver Arrow is a stretch assignment in imagination, both of design and technology. It remains to be seen how much of that gets ported into the reality of road-ready cars.